Borotbists [Боротьбісти; Borotbisty]. The Ukrainian Party of Socialist Revolutionaries-Borotbists (Communists) was the left faction of the Ukrainian Party of Socialists Revolutionaries (UPSR). At the fourth party congress on 13–16 May 1918 this faction gained control of the Central Committee of the UPSR. It advocated a form of government based on workers' and peasant's councils and demanded co-operation with the Bolsheviks. 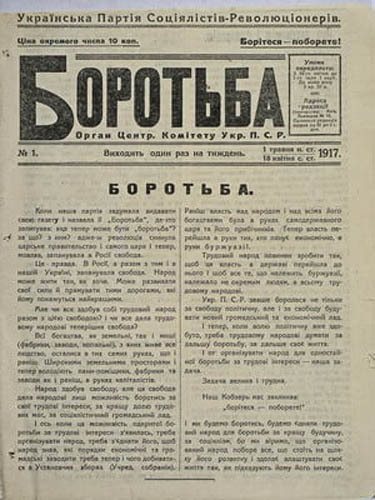 These views were propagated by its weekly Borot'ba, edited by Vasyl Blakytny (see also Borotba). After the Bolshevik occupation of Ukraine at the beginning of 1919, the Borotbists collaborated with the Bolsheviks, and several Borotbists participated in Khristian Rakovsky's Workers' and Peasants' Government of Ukraine (Mykhailo Poloz, Hnat Mykhailychenko, Mykhailo Panchenko, M. Lytvynenko, and M. Lebedynets). At the fifth party congress on 8 March 1919 in Kharkiv the Borotbists adopted a communist but independentist platform and changed their name to the Ukrainian Party of Socialist Revolutionaries (Communists). Then in August 1919, after merging with a left group known as the Ukrainian Social Democratic Workers' party (Independentists), they founded the Ukrainian Communist party (of Borotbists) and demanded admission to the Communist International as an independent ‘national-communist’ party. Their application was rejected, however. At this time the Borotbists had 15,000 members. Because the Borotbists had a strong following among the peasants, Vladimir Lenin accepted a compromise: he promised an independent Ukrainian SSR if the Ukrainian Communist party (of Borotbists) voluntarily abolished itself by merging with the Communist Party (Bolshevik) of Ukraine. In March 1920 the Borotbists joined the CP(B)U. They played an important role in promoting Ukrainization in the 1920s. In the 1930s former Borotbist members were politically persecuted and many were executed. The leaders of the Borotbists were Hnat Mykhailychenko, Levko Kovaliv, Oleksander Shumsky, Vasyl Blakytny, Antin Prykhodko, Andrii Zalyvchy, Vasyl Chumak, Mykhailo Poloz, Panas Liubchenko, Oleksander Lisovyk, Hryhorii Hrynko, Mykhailo Panchenko, and Oleksander Dovzhenko.